This is my favorite woodie. Loads of airtime and speed. It is amazing that you have not seen a ride like this before because the design is so simple but it is extremly effective. If you are not into airtime and prefer twisting then it is probably not worth the trip, otherwise it was well worth the 6 hr. drive just to ride this coaster. Hill after airtime filled hill of one bad mofo of a ride. Shivered my timbers...and Im not even a pirate! How can anyone not like this ride, it delivers like no other coaster beginning to end. Actually 11! If you havent ridden the front seat on this, you are missing massive airtime. Who needs a seat? You spend half the time out of it! 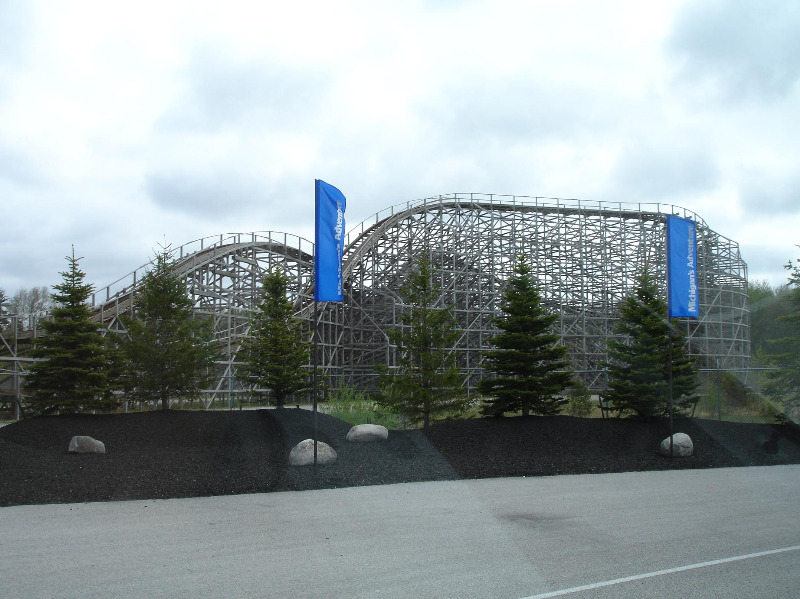 Dont judge this coaster until you have ridden the front car; the rear of the train pushes you over the tops of the hills and practically ejects you. What more could you want from a woodie? Over the years my opinion of this ride has changed very little. Though I no longer love it with the passion I once did I still find it a solid airtime filled expearence with a rip bursing final. True classic fun thats destined to become legend at least in its homestate. One can only hope that Cedar Fair keeps it running good even when its a supporting attraction to something else. Oh the airtime! The perfect single out and back. This is hands down, the greatest coaster I have ever ridden. This coaster has airtime on every single hill! This coaster has not been Mean Streaked yet, and hopefully, Cedar Fair will know not to add brakes to this coaster. The helix at the end is great (but not beast great). This ride is the only ride I can say is 10 worthy. The rest of the park is kind of crumby, but this alone is worth the trip. WOOD COASTERS RULE!!! We travelled to Mich. Adv. just to ride this coaster. It was great fun and the air time was phenominal. The back seat is the best! This the best the BEST Woodie Ive ever ridden on. I love the jolt in the middle of the track. And the first hill is the bomb!!! One of the best woods I have ridden. THE ONLY ROLLERCOASTER IN THE PARK WORTH RIDING.